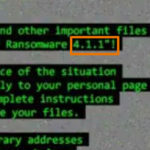 Hey !, I found this information for you: "Cerber 4.1.1 Cifrado de archivos Eliminar el Virus y Restaurar los archivos (Cerber actualizado v4.1.0)". Here is the website link: http://sensorstechforum.es/cerber-4-1-1-cifrado-de-archivos-eliminar-el-virus-y-restaurar-los-archivos-cerber-actualizado-v4-1-0/. Thank you.